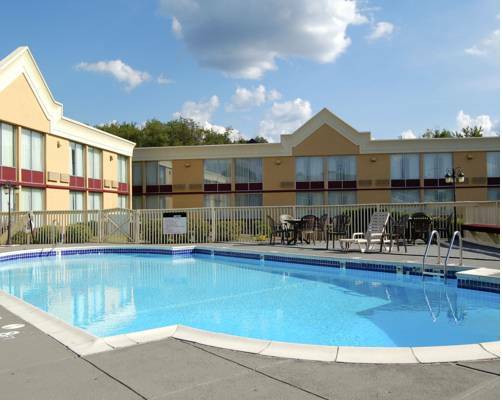 The Quality Inn and suites of Indiana is conveniently located one mile from the campus of Indiana University and offers the very best in customer service. Guests will enjoy complimentary wireless high speed internet access throughout the hotel, a complimentary continental breakfast each day, a seasonal outdoor pool and a well-equipped exercise room. Rooms with microwave/refrigerator available upon request. Pet accommodation: 20.00 USD per pet per night. Pet limit: max 2 pets per room, up to 20 pounds. Safe Charge 1.50 plus tax per night. Reservations not cancelled by deadline will be charged 1 night's stay, or full amount of stay for reservations requiring prepayment. A beloved movie star in bronze. The plastic replica statue is inside the adjacent museum. A bar well regarded for its profusion of stuffed and stiff mammals on the walls. Kiddie Fairy Tale Park where actors dress as Goldilocks, Mother Goose, etc., and give out lollipops and crackers. Part of the much larger Idlewild amusement park. Even if you miss the groundhog's Feb. prognostication, there are things to see and do. Start at the Punxsutawney Weather Discovery Center.